Social media is now the place where people are gathering en masse to discuss the news with their friends, neighbors and complete strangers. This change in news consumers’ behavior is proving to be a challenge for local news, but it is also an opportunity. Users and system generated data from social media can also be a boon for content creators. As part of the Social Media Lab’s participation at the “Is no Local News Bad News? Local Journalism and its Future” conference last month, we presented an exploratory analysis of how publishers can use social media analytics and text analysis to gain insights into their audience and how to use this information to foster a stronger sense of community around their brand of journalism. 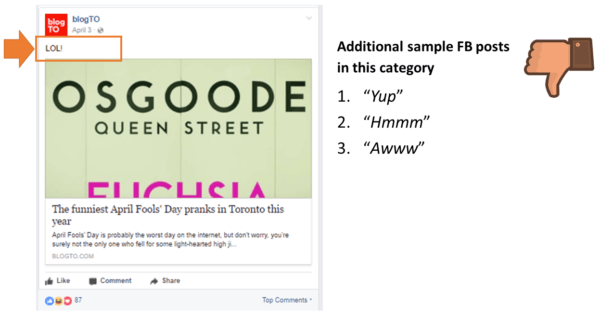 Our presentation (our slides are included at the end of this post) was based on a case study of the public Facebook interactions of the readers of BlogTO, a Toronto-based media outlet. BlogTO has over 300K followers on Facebook and has made a name for itself as “Toronto’s source for local news and culture, restaurant reviews, event listings and the best of the city.” We wanted to find out what the readers of BlogTO are interested in and what engages them. 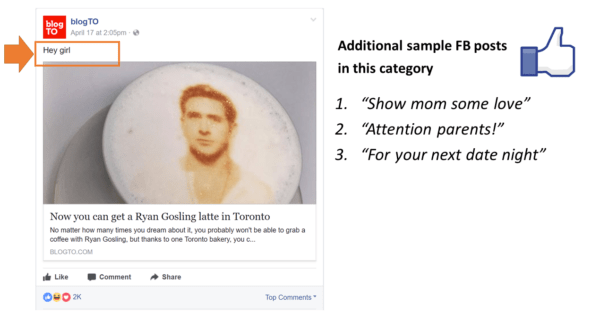 More specifically, we wanted to know what kinds of BlogTO posts get more likes on Facebook. Are there certain types of BlogTO content (videos or photos) that are more engaging for readers? Are there linguistic cues that we can use to predict the ‘likability’ of BlogTO’s posted content on Facebook? *If you are in a rush, feel free to jump to the Results section below! To mine and collect data from BlogTO’s Facebook page we used Netlytic, a cloud-based social media analytics platform developed by the Social Media Lab. In total, we collected 17,748 posts and replies between April 3 and May 3, 2017. We then isolated the dataset for content posted by BlogTO, comprising of 641 posts. To comb through and analyze our dataset, we used the Linguistic Inquiry and Word Count software (LIWC), an automatic text analysis tool with an extensive (90 categories) dictionary. 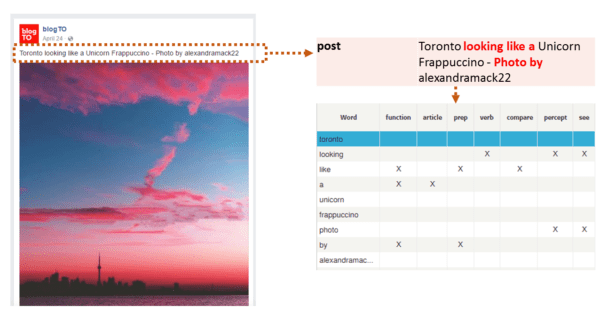 LIWC measures the emotive, psychological, behavioral, cognitive and structural components of text and we used the software to uncover the subtle linguistic cues that might influence or predict the ‘likeability’ of BlogTO’s Facebook posts. The output from LIWC was then transferred into the Statistical Package for the Social Sciences (SPSS) for automatic linear regression modelling. In addition to the 90 LIWC dictionary categories, we also tested post content type (videos, photos, links, status updates, events) as a possible predictor of BlogTO Facebook likes. Ten variables were found to be statistically significant (p<.05), below we present our stronger predictors and notable anomalies. Video content was found to be the strongest (8x stronger) predictor of Facebook likes. This was surprising, especially when considering that video content made up just 6% of posts in our dataset. Interestingly, we noted that most of the video content posted by BlogTO was related to food (food festivals, new restaurants, ethnic cuisine). BlogTO posts with high ‘social processes’ (a LIWC category denoting human interaction, talking and sharing) predicted an increase in the number of Facebook likes. This wasn’t surprising when most people who use BlogTO do so to organize weeknight or weekend events that often include family and friends. BlogTO posts with high ‘informal language’ (fillers, assent, slang) predicted an increase in the number of Facebook likes. That BlogTO posts with high ‘netspeak’ (e.g, btw, lol, thx) predicted a decrease in the number of Facebook likes was an unexpected anomaly. Our results tell us that local news sites and media outlets like BlogTO can improve their online traffic and their ‘likeability’ factor by not only sharing content, but also by engaging and conversing with audiences. Videos are great way to gain traction with audiences, and are far less static than photos. Local news sites and media outlets should also be strategic with informal language, and use ‘netspeak’ sparingly in favor of more context specific posts. Our results also tell us that audiences appreciate future-forward posts with information on specific events and fun activities happening in Toronto. Note: This project was completed with Philip Mai, Director of Business & Communications at the Social Media Lab.